A.K.A. EVERYTHING EVERYBODY'S EVER WRITTEN ABOUT US. Bad romance, late nights out, the intersection of love and squalor...That's traditionally the stuff of great rock and roll, and it's the territory My Own Worst Enemy inhabits with this album, which makes good on the promise of their last few years of heartfelt live shows. By now they've found a sound that isn't quite garage, or pop, or alt-country or psychedelic, but they can call on all of it when a song demands. And the songwriting is definitely the point here, as Sue and Steve's tunes and lyrics key into the joys and dramas of a life in bohemia. This band knows and loves its Boston roots, covering Tribe's previously-uncoverable "Abort" (one of three outside surprises here) and dedicating "The Kids Don't Care" to a certain keeper of the local flame. Electric Like the Moon doesn't sound like some old-school throwback, but it does take you back to the days when a night in clubland was a true adventure, and the bands didn't mind trying to change your life just a little. On the latest full-length release from this excellent trio, rumbling toms and drama-building feedback immediately set the stage - you are about to be rocked. The rocking is accomplished without needing a bass guitar, by Steve on guitar wizardry and vocals, Sue on rhythm guitar and sinewy lead vocals and A.J. of the killer drums. The lead track, "Turn it On" forms a powerful one-two punch with "Used to Be a Fighter," the record's standout second song. Harmonica makes an appearance on Total Action, as does piano, and assorted electronic touches, but this is a guitar record, full of lean, muscular six-string hooks and strong-willed melodies. When the band eases up on the fourth track, another standout, "Green Apple," the result is equally affecting; no matter the tempo, the result is strong without being surly, and honest without being contrived. The honesty of the songs may owe itself to the fact that the band recorded Total Action largely live over three long weekends in Vermont. Recording that way at Pete Weiss's cavernous Verdant Studios, MOWE makes Total Action hang together like a real record rather than a collection of songs. Much like their music, the band maximizes the effect of its vocals, without doctoring them up, by adding subtle harmonies to Sue's leads, having Steve and Sue alternate verses, and changing up lead vocal duties and arrangements from song to song. 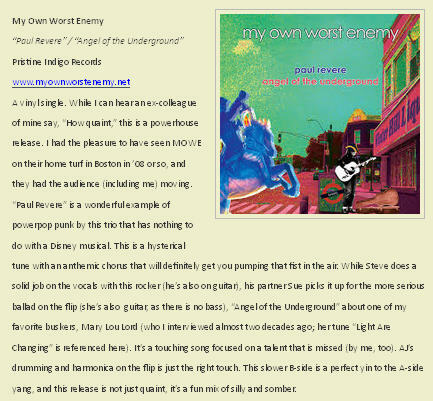 The guitar/guitar/drum trio My Own Worst Enemy was inspired by Sleater-Kinney to become a bass-less band. But whereas that band was most often a noisy outfit, this group alternates between loud rock and softer folk. Total Action, though always active, moves at various speeds and levels throughout. You can tell a lot about a group simply by examining the songs they choose to cover. In this case, MOWE takes on works by two of America's best female songwriters. The first is "Drunken Angel," a sad tale about a brilliant, alcoholic Texas musician, penned by Lucinda Williams. The second is "Redondo Beach," by punk-poetess Patti Smith. Each of these tunes features guitarist/vocalist Sue's authoritative vocals. Nevertheless, MOWE is by no means its own rival when it comes to original material. The peppy "Catherine the Waitress" is particularly memorable for its harmonica part. Guitarist/vocalist Steve also sings some of these songs, and he comes off like a weary psychedelic rocker during the especially mellow "Snowflake". Both singers reveal their softer side via the regretful "Corner of my Eye", which is highlighted by a beautifully twang-y electric guitar solo. At times, Total Action feels like a spirited garage rock offering. This is especially so with "Come On". The track rides atop handclapped rhythms and loose, but enthusiastic, vocals. Other times, as with "Drunken Angel", alt.country is the label that immediately comes to mind. Oddly enough, however, this group is from Boston, which - while certainly famous for its dirty water � is not especially known for its country music roots. This band also deserves extra credit for choosing a wonderful name. Isn't it sometimes the case in love and romance where we are our own worst enemies? How many times have we been jealous without cause? And aren't we simply selfish by nature? Thus, this moniker is like the description of us all. While we're quick to point fingers and blame, when things go wrong, more often than not, it's our own darn fault. We met up with Nancy Neon at The Field in Cambridge to have a pint, watch the Sox and chat about music. read the full interview here. And if you're wondering about the amazing cover photo, that's all from the twisted genius brain of editor T Max; he shot Steve and Sue individually and then merged the faces together. Total Action is the kind of pop record they just don't make anymore; full of fresh sounds and great hooks, with some careful thought between the lines. Leaders Sue and Steve are music nuts who do their influences proud, and they fooled me into thinking their shimmering folk-rocker "Snowflake" was a long-lost 60's nugget. Elsewhere they mix their country and their Velvets up with a lot of vital three-chord stomp. Call it garage rock if you must; but Sue's vocals leave no doubt that garage is in a pretty exotic neighborhood. Every once in a while, I come across a band whose music makes me want to do the moptop head shake and jump around the room. My downstairs neighbors hate it when that happens. They're not very happy today. 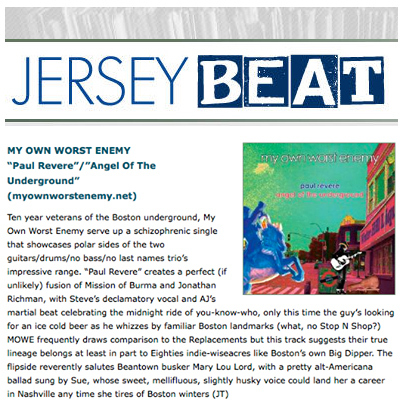 My Own Worst Enemy is a Boston trio that loathes pretension. There's no wandering experimentation on these tracks, no demanding political views. Just raw, punk-fueled, high-energy rock with great hooks and excellent musicianship. It feels basic and solid, wild and fun. The perfect music to shake off life's complications to and just flat-out enjoy. Sue sings lead on most of these tracks, has a gritty Patti Smith edge to her voice. In the quieter, folky tracks like Why Not Beautiful and Late Show, she sings with the same aggressive approach she uses on the harder rock tracks. It's a raw and confrontational voice that never resorts to the bratty shrieking that so many female rock vocalists succumb to. These musicians manage to show off their chops without getting in the way of the song. The whole CD is worth a listen just for the mind-blowing guitar freakout on the bridge of Poison. Most of these songs are short and sweet, around the two-minute range, again showing their penchant for just getting to the point and sparing us the long, experimental solos. Boston based trio My Own Worst Enemy consists of singer/guitarist Sue, singer/guitarist Steve and drummer and backing vocalist John (that's right, they're a completely bass-less band). Having being compared to the likes of poetic rock 'n' roll Queen Patti Smith and indie group Throwing Muses, this band have obviously been making an impression on the industry. 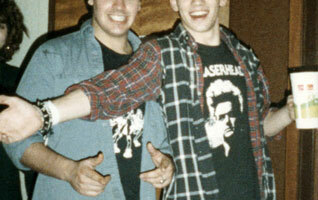 The group's second full-length release is No Guarantees. Poison is without a doubt my favourite track on the album. The music has a dark, sinister atmosphere to it that works perfectly with Sue's smoky, hazy voice delivering the disturbing lyrics. You have to listen to this song! Track 6, Hey Hey Sunshine is a poppy, happy hippy kind of song, with loose vocals and a beat that will get you clapping along, if not waving your tambourine about. I'm thinking wonderful summer days and lots of daisy covered fields. Other highlights of this album include Not the One, with it's grungy guitar, moody vocals and repetition of the lyrics, "I'm the one you wanted, not the one you got." Track 10 is an impressive version of Husker Du's Never Talking To You Again, which is actually pretty catchy. The penultimate track is Yearbook, a slightly strange song with Steve providing lead vocals. The lyrics include repetitions of such classic American yearbook signings as 'have a great summer', 'see you in September' and 'we'll be friends forever'. I'm warning you now, if you listen to this track more than once, you will get these phrases drilled into your head and will probably start using them in everyday life instead of the popular 'Good bye'. Possibly. The album finishes with Pills and Pride, another ballad with heart-felt lyrics and a genuine performance from Sue, who takes the lead vocals. This song really communicates Sue's great voice, and is an effective way of winding down the CD. If you're anything like me you're wondering when this retro-cool trend in popular and indie music is going to end. It just isn't my cup of tea. Now, that being said, I'm not one to turn my back on, or my nose up at a good album. No Guarantees by My Own Worst Enemy made me set aside my lack of enthusiasm for this kind of musical expression. The driving force behind my "turnaround"? Susan Minichiello. What a set of pipes! Her voice is powerful, emotive and intense. The disc's cover sticker mentions the band has been compared to Throwing Muses and Patti Smith. I can definitely see the validity of these comparisons. She's got incredible power and presence, best showcased on the dark and thrilling Poison. Another showcase is Late Show. With its simple musical arrangement, it highlights her voice, showing off its depth. The tracks on which Steve provides lead vocals don't go over quite as well, with one exception: the short, catchy Throw It All Away where the fuzziness of the vocal track softens the nasal quality, making pitch less of an issue, creating a very catchy vocal sound. Musically it's a competent display of retro-feel modern rock. It's not going to blow you away with its awesome display of originality or groundbreaking use of their instruments. But it's certainly well crafted, catchy and, for the most part, quite melodic.